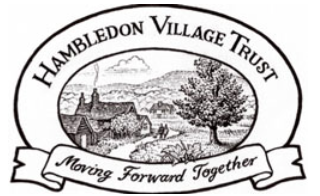 The Hambledon Village Trust was established in early 2003 for the benefit of Hambledon Residents and their community needs. By August 2003 the Trust had secured the future of the shop for the village by purchasing the freehold of the property that comprises the Hambledon Village Shop and Pendle Cottage. The derelict 18th century barn at the rear of the shop building was restored to provide additional space. This was completed in February 2006 thanks to a large grant from DEFRA and generous donations from villagers. The Trustees then launched a project to modernise the layout of the shop without losing its friendly atmosphere. The building had to achieve compliance with the Disability Discrimination Act and the trustees wanted to make it capable of supporting the business for the foreseeable future. The funding for the upgrade came from grants from the Post Office, Waverley Borough Council, Surrey County Council, Hambledon Parish Council and Hambledon Village Trust. To raise the £7000 not covered by grants, trustee Jane Woolley walked an impressive 70kms in 70 hours, starting the walk on her 70th birthday. Sponsorship for Jane and her fellow walkers raised in excess of £9000. An extensive team of volunteers put in many hours to make the project a success with the shop re-opening in August 2006. Next was the development of a website for the village. A team of volunteers assembled early in 2007 and the website was launched at the Parish Assembly in April 2008. In 2015 an upgrade to new software made it easier to use and introduced a lot of new features, encouraging more villagers to contribute and use the site. Also during 2007, the Trustees worked with the Surrey Community Foundation to create the Hambledon Community Fund. This provides the Parish of Hambledon with a sustainable source of funding for voluntary and community groups, charities and local residents and to encourage local philanthropy. Launched at the Parish Assembley in 2008, it regularly distributes grants. Please look at the Hambledon Community Fund page on the website for up to date information. As part of the shop’s 25th anniversary celebrations on 17 June 2017 a new outside toilet was officially opened. Later in 2017 the renovations of Pendle Cottage, which is attached to the shop, were completed and the first tenant moved in. In 2018 the Hambledon Heritage Society albums were given a permanent home in the summer house at Cobblers. These can be seen by prior arrangement with the Heritage Society. As Landlord to the shop the Trust is responsible for maintaining the premises; we also contribute to it’s success in whatever way we can. We continue to support the village website by funding the necessary technology and insurance. Ideas for future projects are always welcome.